Are you a sports enthusiast looking for a fantastic and affordable two-passenger sports coupe? The 2018 Nissan 370Z Coupe may be the perfect vehicle for you! With an enhanced driving experience and fresh exterior revisions, the 370Z Coupe is better than ever. Read more about all the great traits of the 2018 Nissan 370Z Coupe below! Why is the interior of the 2018 Nissan 370Z Coupe referred to as a driver-oriented cockpit? One of the best traits of the Nissan 370Z Coupe is its driver-oriented cockpit. A driver-oriented cockpit is carefully engineered to be functional and safe for the driver. The 370Z Coupe features two seats, an instrument panel with a deep scoop, and a full-length center console. The 370Z offers what is known as a layer concept, separating the 370Z Coupe into three distinct layers: an information layer, an operation layer, and a holding layer. The information layer consists of gauges, a 3-pod cluster with oil temperature, voltmeter, and clock information, the tachometer, and speedometer. Driver-oriented features in this layer include a steering column that moves with gauges so visibility is not interfered with if the steering wheel is moved. Items in the operation layer consist of the switchgear, shifter, and steering wheel. The steering wheel has been designed in an oval shape with a kidney-like form, three spokes, large thumb grips, and palm rest areas. The holding layer of the 370Z Coupe consists of the seats, door trim support, and kneepads. The driver’s seat has unique features such as lower seat cushion cutouts for intense pedal-pushing action. What is the powertrain of the 2018 Nissan 370Z Coupe? The 2018 Nissan 370Z Coupe is offered with a mind-blowing 3.7-liter VQ37VHR DOHC V6 engine that features Variable Valve Event and Lift. This V6 engine pumps out 332 horsepower and 270 pound-feet of torque. There are two transmission options: a 6-speed manual with SynchroRev Match and a 7-speed automatic with Adaptive Shift Control. The 2018 Nissan 370Z Coupe features what no other model year has before-it was designed with a concept of acceleration development that features Accelerator Pedal Opening and Throttle Valve Opening angles. These work together for stronger and smoother response to acceleration when merging into a highway, ease re-accelerating after braking, and a more relaxed ride quality on winding back roads. What are the safety features I may find in the 2018 Nissan 370Z Coupe? 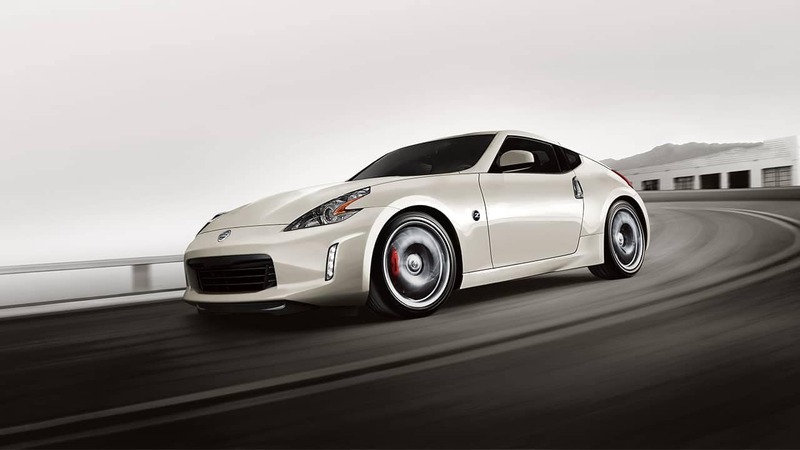 The Nissan 370Z Coupe has many standard and available safety features. Every 370Z Coupe comes with Nissan’s Advanced Air Bag System that consists of dual-stage front airbags complete with seat belt sensors and an occupant classification sensor, roof-mounted curtain side-impact airbags, and front seat-mounted side impact supplemental air bags. The Zone Body Construction of the 370Z Coupe features front and rear crumple zones. Other safety features include seat belts with pre-tensioners and load limiters, Nissan’s Vehicle Immobilizer System, Active Head Restraints, a Tire Pressure Monitoring System, and a Vehicle Security System. If you’re looking for a sports car with style, comfort, and an interior designed for the driver, the 2018 Nissan 370Z Coupe will be a great fit for you. We’re excited to offer the latest model of the Nissan 370Z Coupe right on our lot. If it sounds like it could be the coupe for you, give us a call or contact us below to schedule a test drive!